New data about shoppers’ behaviours and sales patters has indicated that under 35s are more likely to visit a bricks and mortar shop than any other age group. British Land’s research published today, which was conducted with Verdict Retail, reveals that 81 per cent of sales to 16-24 year-olds and 80 per cent of sales to 25-34 year olds are made in bricks and mortar retail outlets as opposed to online. The report also shows that under-35s are more likely to browse in a physical store before ordering online later if the product they desired was not available. “Younger shoppers are also more familiar with blending channels, in particular with regards to store browsing,” the report reads. The report states that the success of online retail is not entirely dependent on millenials and reinforces the future importance of having a bricks and mortar presence. 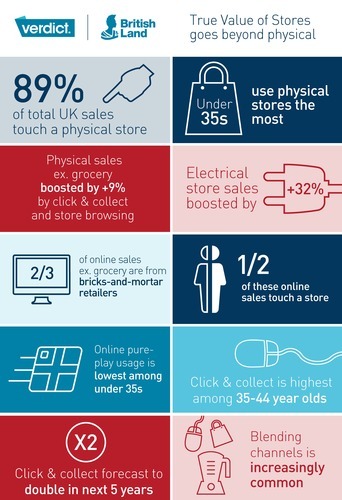 Londoners also exhibited a preference for visiting a physical store when compared to the rest of the UK, while women used click and collect more than men. “We expect to see continued demand for physical stores from a variety of operators, and this research helps to cement their place within retailers’ plans,” Britishn Land’s head of retail business development.Ben Dimson said. British Land and Verdict’s research is based on 30,000 consumers and measures the role of the physical store in an omnichannel age, identifying the share of online sales that touch physical space as shoppers visit a store to collect an item or to browse before purchasing.